We have good news and bad news for you. 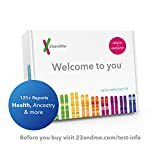 The bad news is that the 23andMe DNA Test kit that was one of Amazon’s five best-selling items on Black Friday is no longer on sale at its Black Friday price of $99. The good news, however, is that if you missed out you can still save some cash if you snag one on Cyber Monday. The kit typically costs $199, but it’s on sale today for $129. Like we said, it’s not quite as good as Amazon’s Black Friday discount but hey… $70 is $70. Want an even better deal on an at-home DNA test kit? The AncestryDNA Kit is one of Amazon’s deals of the day today, and it’s on sale for just $55!